Moderate physical activity during pregnancy is important to help you maintain a healthy body weight as well as your cardiovascular fitness and muscular strength. Regular exercise can also prevent pregnancy-induced complications such as gestational diabetes or hypertension and preeclampsia. There is a broad range of activities that pregnant women can join safely, from walking to strength training or aqua gym, it is always recommended to do it under the supervision of health and fitness professionals. Maintaining your body in correct posture and alignment is part of keeping fit and healthy. The body mechanics experience substantial changes during pregnancy. As the size of your belly grows, the incidence of lumbar pain increases. The hormonal changes also affect the composition of your connective tissue, making your tendons, ligaments, and muscles more flexible than usual, and to a certain point, less supportive. Appropriate exercise will help provide relief of these symptoms. The postural principles relying on the hypopressive technique are designed to improve your overall muscle tone and maintain an upright position. 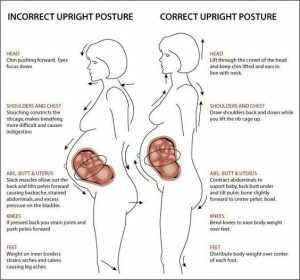 A slouched posture not only will add more pressure to your pelvic floor and abdominal wall, but also won’t allow your baby to adopt the correct positioning in preparation for birth, which can complicate labor and increase the chance of tearing. The breathing technique included in hypopressive exercises facilitate diaphragmatic release and mobility and helps maintain correct breathing patterns. Is also a good way to induce relaxation, reduce stress and connect with your own body for the future birth. The sequence of poses of the Low Pressure Fitness routine is also designed to act upon the different myofascial chains of the body, normalising tensions and help realign the body. Hypopressive training is relatively easy to learn and can be practiced anywhere as there’s no equipment needed. With committed regular practice, you can start experiencing benefits in relatively little time. Important! Do not attempt to learn hypopressive training while pregnant without a qualified instructor who knows the modifications needed to make this practice safe for you and your baby.